Former Gor Mahia striker Edwin Lavatsa has been released by Algerian club MC Algiers. Lavatsa is among 14 players released by the club hardly six months into his two year contract. According to several Algerian news channels, the club was keen to have a lean squad of 25 players. Lavatsa is particularly blamed for serious mistakes which cost the team in the just concluded season. 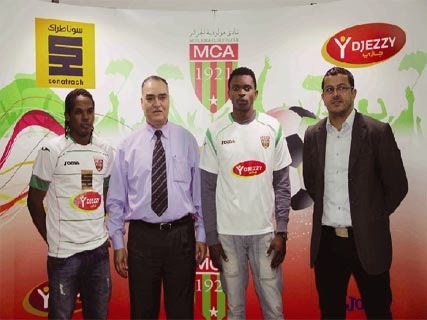 “Mc Algiers has decided to release half of its work force as they prepare for the new season,” said the news sources. Lavatsa says that an ankle injury and change in the coaching department is the reason he was dropped by top Algerian club MC Algiers. “I sprained my ankle four weeks ago and it became difficult to train. The club called me and gave me an ultimatum, either to take a huge salary cut or terminate my contract and get paid half of its remaining value. I opted for the latter,” Lavatsa told Goal. The former Gor Mahia hit man also hinted at challenging conditions in Algeria insisting that it was difficult for him to stay in the club. Regarding his future, Lavatsa said he has had contact with a Belgian club and intends to travel there in the next two weeks. Let me first wish Dan ‘Flava’ all the best. As for Love-A-Star am not surprised that he was dropped. HE SIMPLY DOESN’T SCORE. You see Gor inabeba players wengi who after showing the initial potential don’t really improve. In reality Lavasta’s scoring rate is always poor, so is Ade’s,Wanyonyi’s,Dube’s even Rama’s has dropped. When fans point this out they are labelled negative only 2 b proved right when these players move out. Jagoal/Musa r players who will find it tough if they move even 2 AFC. Lavatsa, aLL WE CAN DO IS TO WISH YOU ALL THE BEST IN YOUR PURSUIT FOR GREENER AND FINANCIALLY REWARDING PASTURES. You can now see that it’s a jungle out there and those who succeeded like Mariga, Oliech and Wanyama had to undergo all these before they succeeded. I said it and I was labelled a ‘tyrant’….in gor mahia talent without leadership is like a beautiful house with poor foundation. Welcome back lavatsa, sserenkuma,otieno, bolotieno, Rama, musa, oboya , ade and the thousands of others who simply are not nurtured and groomed well enough by the leadership in this country to fit into the paid ranks. Oduor, true Lavasta just did not mature to take up that stage. What he is thinking now is even worse – Belgium who reach Qfinal in the world cup will be more competitive. the power of a striker is to score, if you don’t you are useless. Why are you bloggers throwing venoms at Lavasta? Well said Joe Riaga. You are all stupid, ignorant, noise makers, thugs, stone throwers, hooligans, spineless, useless, brainless and joyriders fans that only know how to make free entry to stadias while the club is in the red financially. Mr. LAVASTA We still love you when you out there to expand your territory . Be the best in everything you do and keep fighting until you get . We GOR MAHIA fans that believe in greener pastures bless you.